Since I wrote back in August about what was happening with my skin (I have an ongoing battle with my skin which you can read about here, here and here should you wish) things have gone a little awry and my chin has been somewhat of a war zone since February. I know that my problem is hormone related but I really thought things would have settled down by now. I'm currently finding it weirdly amusing to cover my chin with my hand when I look in the mirror, the rest of my skin is pretty much perfect. I find myself obsessing over chins. Odd, right?! When reading blogs or magazines and when watching TV I end up zoning in on people's chins wondering why their skin is so nice there when my chin is marked and scarred even when not covered in spots and cysts. It's not a healthy obsession to have. I am jealous of other people's chins and skin in general. Jeeze. I can't believe I'm even admitting that to be honest. So what have I been using during this time? I stuck with this for a while before dropping down to two steps, I ditched the toner as I found it too harsh. It was making problem areas on my chin red and raw. Not a great look. After a while I dropped down to just using the moisturiser as the cleanser became too strong for my skin. It's a shame as it had worked for me for so long. 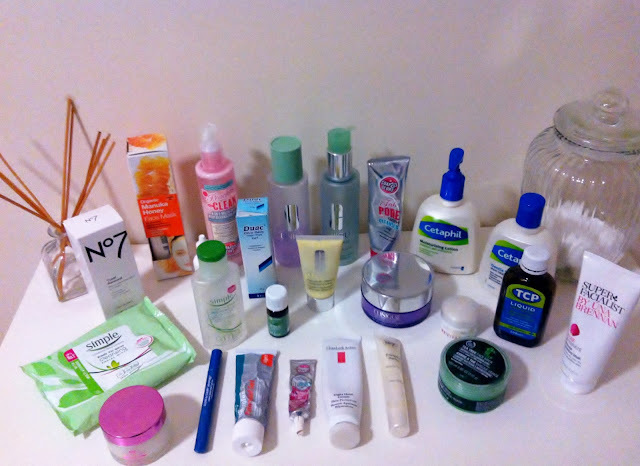 I'm almost out of the moisturiser and on the hunt for something to replace it, but I have no idea where to even start. I need something that will sooth my skin but also make a good base for my make up. I'd heard so many good things about this cleanser and their website states that "it's the best cleansing milk on the market". It's more of a cleansing cream in my opinion, it's far too thick to be considered a milk. I found that this soothed my skin and made my skin softer but it did nothing to reduce the cysts (oh yes, they're back) on my chin. Perhaps I didn't use it long enough, but when you're in pain (so much so that it's painful to talk and eat) and you're taking 400mg of ibuprofen twice a day just to numb the pain from your skin it's all too easy to jump from product to product to try and find the wonder product. To be honest, I've been using this for quite a while - maybe two years. It's amazing at taking off all of my makeup, including really stubborn mascara. Although it hasn't done anything for my skin I do feel that it is a great start to my evening cleansing routine as I know that after I've used it all my makeup is gone. I bought this before my skin went crazy and found it delivered great results, my skin is so smooth after using it. After my skin broke out I stopped using it as I was afraid that as it is an exfoliator it may spread any bacteria on my face around, which in turn would spread the spots. In the last two weeks I've started using it again as my skin is a little better, I've used it very sparingly just on my chin and it has helped to remove the dry, flaky skin that the Duac cream has caused. I'm hoping that if/when my skin clears I'll be able to go back to using it properly as it really is good. As well as using the hot cloth cleanser from Soap and Glory I've been using this to take my make up off prior to cleansing, just to mix things up a little. It's more expensive than the hot cloth cleanser and I don't feel that it's as good, I don't feel completely make up free after using it. Maybe it's because I only use warm water to take it off, I think taking it off with a cloth would yield a better result. I only found out about Cetaphil by chance, I was browsing the web looking for skincare recommendations from people also suffering the same problem as me and I came across it. It's super, super gentle. The cleanser has definitely helped calm my skin but I don't feel that it's preventing new occurences or made current problems better. I'm really not a fan of the lotion, it's far too greasy for my liking and the pump dispenses far too much product for my liking. I'm going to persist with the cleanser twice a day until I can see my GP later this month. Yesterday I ordered REN Hydra-Calm Cleansing Milk and Elemis FreshSkin Clear Treatment Gel. Both products are next in the line of products I'm hoping will help me. I've wanted to try REN for a number of years after my mum started using their products, this cleanser is made for sensitive/delicate skin, which mine definitely is at the moment. I'm hoping to use the Elemis gel as a replacement for my Duac cream as I just don't feel like I can carry on using it. What I like about the Elemis gel is that it can be used in the morning and the evening, at present I can only use the Duac at night so fighting spots during the day will be a perk. As for face masks, that's a whole other post altogether. Have you suffered with problem skin? What helped you? Any tips on which moisturiser I should use next?